The Cleaning System is an tool for cleaning Sega Mega Drive cartridge slots and cartridges. All video game cartridge slots accumulate dust and dirt over time, which can have a detrimental affect on the console's ability to play games. As there are usually no moving parts on a cartridge-based system (as opposed to a CD-based system), damaged or obstructed pin contacts are the primary cause of failure, and so it was not uncommon for companies to sell cartridge cleaners of various shapes and sizes. 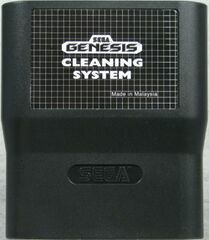 Though many were created for the Mega Drive, the Cleaning System is the only method officially endorsed by Sega. The Cleaning System is a simple device which simply extracts dirt. Unlike other cleaners, it requires no fluids, although depending on the situation this may mean it does not fix the problem. The bottom, thinner side is for cleaning cartridge slots, while the top is for cleaning Mega Drive catridges. The cleaning operation simply involves inserting and removing the device. The majority of third-party alternatives offered more cleaning choices, such as variable-sized "brushes" of differing lengths and widths. This means while Sega's Cleaning System is restricted to just cleaning Mega Drive cartridge slots/cartridges, its competitors could be used in a variety of systems, and were often sold at a lower cost. Cleaning Systems were sold throughout the lifespan of the Sega Mega Drive in North America, but were not sold in other regions.